Ajay Talwar of The World at Night took this photo of Jupiter, and the stars Aldebaran and Capella on Oct. 2012 from the campus at Devasthal Optical Telescope, Uttarakhand Himalayas in India. 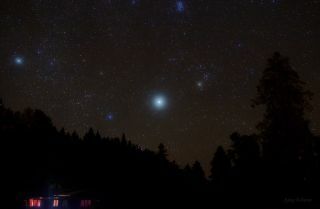 The bright stars Aldebaran and Capella share the spotlight with a glowing Jupiter captured in this image over the campus at Devasthal Optical Telescope in the Himalyan peaks of Uttarakhand in India. Veteran astrophototgrapher Ajay Talwar of the space photographey group The World at Night took this spectacular photo in October 2012. "Jupiter easily outshines the nearby bright winter stars Aldebaran and Capella. Old and exotic skyscrapers (pine, oak and cedars) line up the calm meadow at the campus of DOT, Devasthal Optical Telescope, Uttarakhand Himalayas in India," said Talwar. Aldebaran is a red giant star about 65 light-years away. It appears to be surrounded by the star cluster Hyades. The sixth brightest star in the sky, Capella shines with a distinct yellowish hue , in the constellation of Auriga, the Charioteer. He added that a 4-meter Liquid Mirror Telescope and a 3.6-meter optical telescope are being built about a kilometer above this meadow—on the peak.